No Limits is proud of its dedicated staff whose colletive passion helps hundreds of children with hearing loss and their families bloom to their full potiential. Michelle Christie, Ms.Ed., CCC, Ed.D, founded the nonprofit organization, No Limits, in 1996. After 18 years in the entertainment industry, Dr. Christie decided to follow her dream of working with children with hearing loss who speak and listen. She changed her career path and earned a Masters Degree in Education, with a full fellowship and distinguished honors from the USC/John Tracy Clinic Program. She later received her Doctorate in Education from UCLA. Her dissertation focused on the needs and experiences of low-income Latino parents of school-age children with hearing loss. She has been invited to present her findings throughout the country, as well as internationally, including the Hearing Across the Lifespan (HEAL) Conference in Italy with representatives from over 60 countries in attendance. ​Juliana Scott joined the No Limits team three years ago with over 10 years of theatre experience, including performing, stage managing, directing, and producing. While completing her bachelor’s degree in Linguistics at UCLA, she served as the Managing Director for HOOLIGAN Theatre Company, a student run theatre company that produces a five show season annually. She is currently pursuing a Master’s Degree in Nonprofit Management at Antioch University. Juliana has found her home at No Limits, a perfect combination of her love of theater and language. Eileen Nelson has over 30 years experience in theatre and has directed and produced No Limits productions on the East coast for the past 15 years. She also coordinates all the productions nationwide. Eileen has been with the organization since 1998 when her daughter, Christen, who is deaf performed in the first No Limits New York production. Eileen provides guidance to parents who enroll in the program and offers them help not only during the productions, but also throughout their child’s school age years. Her daughter is currently enrolled in a Masters program for Occupational Therapy. Eileen credits No Limits for teaching her how to be an advocate for her daughter. 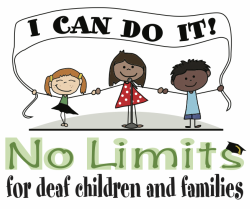 No Limits is proud of its certified teachers of the Deaf, auditory verbal therapists, reading specialists, music and arts teachers, and collaborating audiologist. No Limits also appreciates all its theater directors, workshop team members, and volunteers nationwide.